Your appointment will last about 40 minutes. As a "first-time" patient we will ask you to sign a simple consent form before you see the osteopath. We will then ask you about your current problem and how it relates to your day to day routine. We will also take a general medical history and ask you about any medication. You may then be asked to remove any necessary clothing, sometimes down to your underwear so we can examine you. 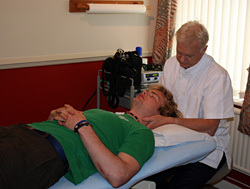 This examination involves various movements, some done by the patient alone and others by the osteopath. Having completed this examination we will have a good idea whether osteopathic treatment will help you. Sometimes we may request additional tests, eg. blood tests or x-rays and, having discusssed this with you, will liaise with your GP. Referral to other practitioners may also be suggested, either a hospital consultant or another complimentary therapist. Treatment is mostly carried out using our hands. Osteopaths have a highly developed sense of touch which is used to analyse the function of the joints, muscles and ligaments of the body. Once the problem is pinpointed, we use a combination of manipulative techniques tailor-made to your particular state. Techniques range from gentle massage and repetitive stretching to specific joint-releasing "clicks". 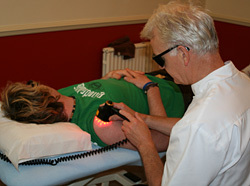 It must be stressed though, that most patients find treatment pleasant, relaxing and rarely painful. On occasions, more subtle techniques are employed, especially with children. For example, in this clinic we utilise a treatment regime called Cranial Osteopathy, which is especially gentle, very subtle and can be used on infants and children. Where necessary, Ultrasound, Low Level Laser or acupuncture may be used. As well as physical treatment, we will advise on ways to avoid future problems eg exercises or changes in lifestyle, posture, diet etc. Most people improve within 2-5 treatments. If the condition is more complex or long standing further treatment may be necessary. We aim to keep your appointments to a minimum and will advise you on this at the time of consultation.